At the start of this year, I decided I would finally enter my short stories into contests - the more wins and acknowledgements under your belt, the bigger your name is in the "writing world," and the better chance for traditional publishing! I entered just three contests - and my story "Rabbit" earned a semi-finalist spot for the 2018 William Van Dyke Short Story Prize with Ruminate Magazine! Yes, out of 420 entries, mine was one of the 39 semi-finalists, and it's on the website announcement, too! I'm so excited, and it makes me that much more revved up to write and share my words! Whether or not the plan was executed, the boy was unsure. It seemed like an epic way to die, but was it, truly? Shot in the head in your bathrobe while bending over for the morning paper – is it really that poetic? Would he want to be killed by a sniper? He pondered this as he heard distant voices trying to push through the pressure in his head. Does this, perhaps, intrigue you? I'll definitely submit this story to other contests and publications, too. Don't forget to check out my surreal short and art book "Dadalectic" and my newest photography book "Trip to Italy" also available on Amazon! My "SCREAM" Featured in 'Maintenant 12'! Maintenant 12: Contemporary Dada - Now Available! Mountain of Laughs Comedy Film Festival! Geena Matuson (@geenamatuson) at the 2018 Mountain of Laughs Comedy Festival with Breaking Fate Entertainment President Willy Adkins, Producer Tom McNicholas, and actor Chuck Winstead, who also assisted with the event. Also pictured is filmmaker Hezekiah Bennetts, Cinematographer R. Mark Ramey. I had a great time at the Breaking Fate Entertainment Mountain of Laughs Comedy Festival last weekend in Gatlinburg, Tennessee! Two films from my Fauxmercials series screened at the event including "The Best A Man Can Get," which opened the evening block of films, and "Depends." It was awesome to see them on a big screen before an audience! What's more - my film "The Best A Man Can Get" won Director's Choice Award! The award was granted to me by the Festival Director and Breaking Fate Entertainment President Willy Adkins, and my mom managed to snap a few quick shots of my award acceptance, haha. Geena Matuson (@geenamatuson) presented with Director's Choice Award at Breaking Fate Entertainment's Mountain of Laughs Comedy Film Festival in Gatlinburg, TN, 2018. See more @ https://thegirlmirage.com. Geena Matuson (@geenamatuson) with Breaking Fate Entertainment President Willy Adkins and ventriloquist Kyle Scribner of "Kyle and Crew" at the Mountain of Laughs Comedy Film Festival in Gatlinburg, TN, 2018. See more @ https://thegirlmirage.com. Geena Matuson (@geenamatuson) and ventriloquist Kyle Scribner of Kyle and Crew at the Mountain of Laughs Comedy Film Festival in Gatlinburg, TN, 2018. See more @ https://thegirlmirage.com. Around the first intermission, the festival featured a live performance - a ventriloquist! Kyle and Crew did an awesome job, and I am a huge fan of ventriloquists (I totally wanted to do that...and I sorta still do), and so it made for a fun break between films. Breaking Fate Entertainment also hosts other events in the state, including two other film festivals. This festival may not be around next year, but perhaps I'll enter some other Breaking Fate festivals - their Chicago Horror Film Festival is huge! My mom and I made a whole trip out of this event, something to do together before I head to New York in June. Despite the overcast and rainy weather, we managed to tour around and take photos! She also took the photos at the festival, and thanks a lot mom! It was great to meet everyone, and have my work seen by others. The films inspired new ideas and storytelling devices. You can check out my films on Vimeo, and join my newsletter for other events and updates with my work! Muse Creative Awards are international advertising awards, a competition for creative professionals who possess the unique ability to inspire with a concept, idea or design. Winners range in levels Platinum, Gold, and Rose Gold. Rose gold has become one of my favorite colors, so I'm pretty happy with the results, haha. It's so exciting to be recognized by advertising awards, as that's the direction in which I'd like to move in my future career. I sort of stumbled upon these competition results. In doing some further digital marketing research into my own brand 'The Girl Mirage,' I used a free SEO tool by Moz to see which websites are linking to my website, also called 'backlinking.' I noticed a series of links from Muse Creative Awards, and I wondered why; I had entered this advertising and design competition in early 2017, and hadn't heard from them since. Curious, I clicked the links and, lo - I had my own winner's page. I won! I don't know what I did with the initial notification email, but I was sent a new one complete with a form so I can get my official certificate! This really gives me further drive to continue creating new work in this style - my style. It's relaxing to create new work, too, as compared to the marketing aspect of things. You can be sure that new series will come in the new year. 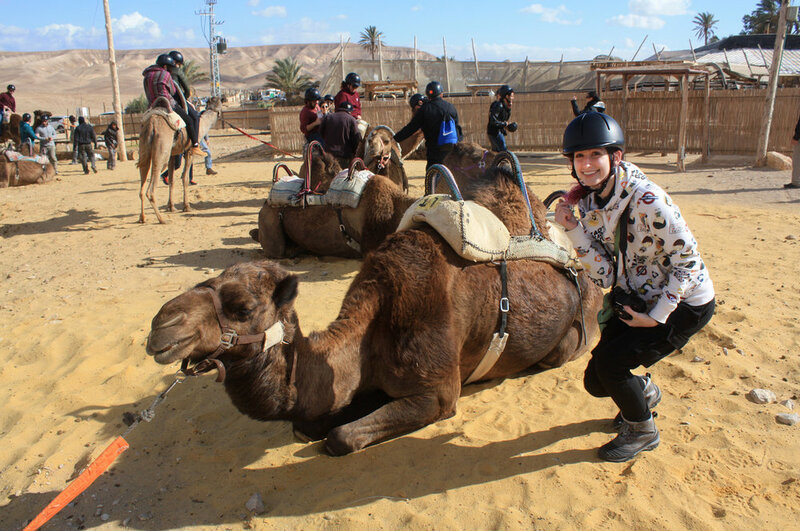 Geena Matuson with her camel on trip to Israel in December 2016 with Birthright Israel group Shorashim #Bus636. Photograph taken by Jessica Gallagher Steuver. I was accepted into the Masa Israel Teaching Fellowship program (MITF) to teach ESL to children in Israel for the 2017-2018 school year! This program is in partnership with Israel’s Ministry of Education and The Jewish Agency for Israel, a once in a lifetime opportunity to immerse myself in Israel’s culture while also gaining teaching experience overseas. Jessica Gallagher Steuver and Geena Matuson in Jerusalem's Shuk Machane Yehuda, December 2016. When I returned from Israel after my December Birthright trip, I immediately started looking for (heavily subsidized) ways to get back overseas. The Masa Israel programs were recommended to me and I happened to receive two recruitment emails from their program coordinators. I figured it was a sign; with graduate school acceptance letters out and my future up in the air, I didn’t know what to do. However, I wanted to do something – so, I decided to apply to the MITF program and see what would happen. After my first two PhD rejection letters arrived on the same day – Valentine’s Day – I figured that was it for graduate school, and so pushed for my Israel fellowship application acceptance. Through a grant gifted by the Government of Israel, this ten-month program will cost around $1,000 (more or less), and also pays a teaching stipend. I’ll be living in the sought-after community of Rishon LeZion (Rishon LeTsiyon) in Tel Aviv, near both the water and Old Jaffa, where I'll have the opportunity to further explore the artist district! The view from my room at Deborah Hotel in Tel-Aviv from Geena Matuson's recent trip to Israel in December, 2016. In fact, just two days after my return from Israel, I'll be at the Syracuse Masters program Orientation! Haha, this means some overseas apartment-hunting with the help of my mom, who will also transport my pre-packed belongings to my new place before I return, so I don't have to scramble and pass-out from jet lag. This also gives me more time to look into housing locations for Syracuse, and possibly more grants and scholarships for next year’s academics, too! This is truly when my efficiency and strategic mind have a chance to shine, haha. Well wish me luck on my journey! I'm sure loads of new art and collaborations will follow, haha. Bedouins, Masada and Camels - Oh My! Geena Matuson as Valentine the Vampire with Anna Rizzo as Ginger in a promotional image for Mike Messier's 'Disregard The Vampire,' 2014. Photography by Chris Hunter, Post-Production by Geena Matuson. It's official - the promotional poster for Mike Messier's 'Disregard The Vampire' has been selected to feature at the UnderGround FilmFest in Ancona, Italy!